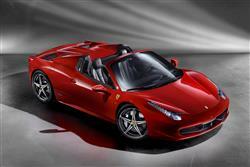 Find out everything you need to know on the new Ferrari 458 from independent vehicle review website Car And Driving. You can watch the video review to the left to see more of the car or read their written review below to get a true insight from an expert in the automotive industry. The Ferrari 458 Italia has never wanted for anything in the audio department but a Spider convertible model gets you even closer to that V8 soundtrack. Jonathan Crouch reports. The Ferrari 458 Spider gets the same 562bhp V8 that's fitted to the Italia coupe but teams it with a slick two-piece electric hard top that folds in just 14 seconds. Unlike many open-top supercars, the Spider looks great with the roof in place too. Ferrari couldn't have written a better script for its 458 Italia. This was the junior supercar that made the Lamborghini Gallardo suddenly feel ancient and which rendered McLaren's much-vaunted MP4-12C somewhat antiseptic. If you want capability, beauty, drama and a soundtrack that'll stand the hairs on the nape of your neck to attention look no further. The choice is easy. Or rather it has been until now. Debuting at the 2011 Frankfurt Show is a car that eclipses the 458 Italia when it comes to that certain special something. It's the 458 Spider, an Italia with a rather neat ability to flip its lid. Ferrari first showed a car with a clever flipping roof arrangement with its limited run 575m Superamerica, but soldiered on with soft tops for its F360 and F430 Spider models. The 458 Spider moves the game on and then some. The Spider is mechanically identical to the Italia which means it's quite dementedly rapid. Bar room experts will argue all night about the veracity of Ferrari's official performance figures but you don't have to sweat the tenths when you have a 4.5-litre 562bhp V8 right behind your left lughole. It's a fantastic engine that loves to rev in the proper Ferrari V8 tradition. Maranello claims a 0-62 figure in less than 3.4 seconds and a top speed 'greater than 198mph'. The 458 chassis was designed from the outset to accommodate an open car so there should be no worries about chassis rigidity. The Spider gets an electrically adjustable rear wind stop that rises between the faired rollover humps. Ferrari reckons this allows conversation at speeds of over 125mph. Whether this conversation involves a purely Italianate waving of arms is not clarified. Like the coupe, power is sent from the mid-mounted engine to the rear wheels via Ferrari's double-clutch gearbox marshalled by wheel-mounted paddle shifters - there's no manual option. Helping to get it all onto the road efficiently is the highly advanced e-diff electronic differential and the F1-Trac traction control system found in the 599. The problem with most convertible versions of existing coupes is that while they look a million dollars with the roof down, they usually look a bit less elegant when the hood's in place. There are no such worries with the 458 Spider. In fact, it looks almost identical to the coupe, perhaps even a little cleaner with the roof in place as it does without the air intakes on the C-pillars. The roof itself is a very clever two piece aluminium unit that is pretty much a targa panel that flips over and sits in front of the engine, operating in just 14 seconds. Ferrari claims it weighs around 25kg less than the usual system of motors and pulleys of a conventional soft top. With the hood down, the Spider's silhouette remains clean and tidy albeit dominated by the two humps that house the rollover protection system. There's even a rear bench for luggage that helps boost the Spider's practicality. It's still not a car that rewards those who can't pack light but at least you'll be able to do more than carry a toothbrush, a change of underwear and a credit card. Demand for the 458 Italia has held strong despite some tough economic conditions and Ferrari shouldn't experience a great deal of problems selling all the Spider models I t can make, even with many typically specified cars costing north of £200,000. After all, what compares? If you do want an open top supercar there's very little to touch the Spider. The Gallardo Performante offers just as much drama but the Ferrari is the hottest ticket for 2012. Options for the 458 are more numerous than you might think. Buyers can specify diamond finish forged alloy wheels or super lightweight carbon fibre seats. Then there are numerous accessories and features arranged under the headings 'Racing and Track', 'Exterior and Colours', 'Interior and Materials' and 'Equipment and Travel'. Where there's most scope for personalisation is in the almost infinite number of possible trim combinations for the interior. Your Ferrari dealer will wheel out a vast catalogue of different material and colour choices to adorn the car's cabin. If you can replicate Ferrari's claimed 24mpg combined fuel economy figure, then you probably don't deserve one in the first place. Emissions of 275g/km will also be of peripheral concern to the target customer. What is more important is the residual value of this car and the 458 Spider looks set to do very well here. Early adopters should be able to realise a profit should they sell in the first one or two years although you have to ask what they'd want to trade up to. The Ferrari 458 Spider didn't need to do too much to be a guaranteed success. The Italia coupe it's based upon is a gem, one of those special cars that comes along only very rarely. Ferrari could have fitted a half-engineered toupee to it and demand would have still outstripped supply. Instead it features one of the most elegantly designed tops of any recent convertible and looks great with the top up or down. There's really nothing that comes close to the blend of talents of the 458 Spider. By comparison, its rivals look a little two dimensional and grey. Improving the 458 Italia is one heck of a task, but Ferrari might just have built an even better car.